Former Gamespot employees give Sonic an award… unfortunately. “Gaming is a sequel-driven business, we’ll admit, and we’re perfectly happy to keep playing new installments in beloved series as long as the quality stays up there. Hey, we have a “Most Satisfying Sequel” category for a reason. “2008 continued the trend of Sega producing bad Sonic the Hedgehog games. It’s a trend that’s been ongoing since, well, depending on your perspective, you could claim it went all the way back to the Genesis. Personally, we pin Sonic’s continuing failure to please on polygons, and the gameplay’s failure to stay true to the series’ high-speed roots. There’s only one problem: Sonic Unleashed has moments that attempt to stick to what Sonic does best–running too fast for you to do anything other than watch–and it’s totally boring. GiantBomb is a gaming news, reviews, and Wikipedia-style gaming community website, founded last December by former Gamespot.com employees Jeff Gerstmann and Ryan Davis in cooperation with Whiskey Media. Jeff Gerstmann was forcefully let go from Gamespot.com under vague circumstances related to a review he gave to the game Kane & Lynch: Deadmen. The Publishers of Kane & Lynch (Eidos) were heavily advertising on the Gamespot website at the time, and though nobody has ever come out and stated the absolute truth, many assume Jeff was fired because Eidos was unhappy with his review. Jeff’s departure marked a mass exodus of staff from Gamespot.com, including Brad Shoemaker and Vinny Caravela, who joined Gerstmann and Davis at GiantBomb.com when it launched. Though GiantBomb openly admitted to recieving a review copy of Sonic Unleashed for the Wii the week before it went to retail, no official review for the game has ever appeared on the site. GiantBomb’s unspoken policy has been to only review games that they were interested in reviewing (in other words, they don’t just review every game out there). Most recently, Jeff Gerstmann admitted to having picked up the Xbox 360 version of Sonic Unleashed and sounded off about the game’s flaws on the GiantBomb Podcast for December 23rd, declaring that the game felt like it was made “for children” and that it “practically plays itself”. There is no word on whether or not a review for the Xbox 360 version of Sonic Unleashed will appear on GiantBomb. 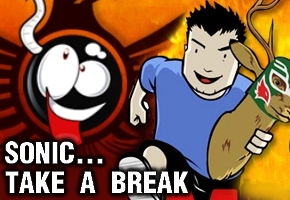 Stick with TSSZ as we cover whatever the industry has to say about Sonic – good or bad.